There is one city which is equidistant from all the capitals of north-west Europe. The centre of the circle whose circumference goes by Reykjavik, Stockholm, Berlin, Brussels and Paris is Kirkwall in Orkney. The road skirts the three great firths that, from the east, invade the northern counties of Scotland – the Beauly, the Cromarty, and the Dornoch Firths … It bears the traveller out of a genial, well-farmed, or wooded landscape on to the bare nobility of rising hills. It strides across the Ord of Caithness, dips steeply to hidden Berriedale, and threads a long moor, untenanted and lugubrious under rain. There are two ways to cross the Pentland Firth – three in summer. A modern catamaran run by the island company Pentland Ferries crosses from Gills Bay in Caithness in an hour. It arrives in St Margaret’s Hope in South Ronaldsay and the road onward runs over the four Churchill Barriers and past the Italian Chapel. Alternatively there is the NorthLink service from Scrabster, to Stromness. It takes half an hour longer and passes the Old Man of Hoy and the high red sandstone cliffs of the island. In each case you can take your car. For foot passengers there is the summer service from John O’Groats to Burwick in South Ronaldsay, run by John O’Groats Ferries. It’s a 40-minute crossing, running from the start of May to the end of September. In each case there is the journey north from Inverness, winding along the coast past pastures and moorland, with sometimes the sight of a sandy beach or breaking waves, through the towns of Golspie and Brora and on to Wick or Thurso. The railway runs north alongside. An alternative route with a car is to go by the NorthLink ferry from Aberdeen. This is an eight-hour journey but reduces the amount of driving if you’re coming from a distance. 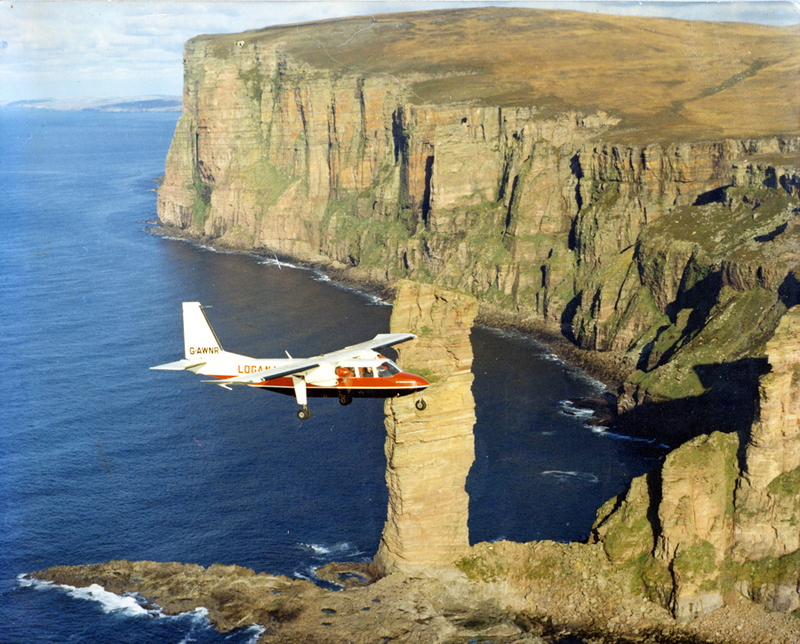 Orkney is linked by air to Edinburgh, Glasgow, Inverness and Aberdeen, and through them to London and beyond. The Orkney air routes are part of the Flybe network, operated in Scotland by Loganair, and you can connect with British Airways or easyjet flights elsewhere. 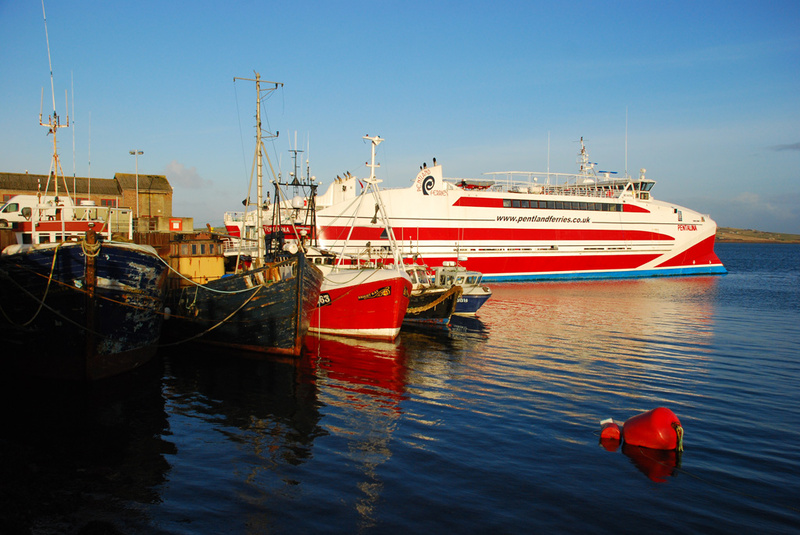 For visitors from Norway and Sweden, the journey to Orkney is even simpler in summer, with a twice-weekly direct air link with Bergen, every Wednesday and Saturday from 18 May. For accommodation there is a wide range of hotels, guesthouses and self-catering, with plenty to choose from in the two main towns of Kirkwall and Stromness or in a country area. The range of options is so wide that it is worth taking time to choose carefully. Some places stand out for their location, others for their friendliness; some for their furnishings, and some for the value of what they provide. The best starting-point for accommodation is VisitOrkney, who can send you a detailed brochure, which includes a wide range of general information as well. Food is usually a treat, with a variety of places to choose from, which take a pride in providing good food from good local ingredients. You can eat in hotels or restaurants, in café or bistro style, and with sometimes some fine sea or harbour views. The VisitOrkney site has some suggestions for options for eating out. There is further information about Orkney products and much else on the Orkney.com site. It’s as well to pack in clothes that make you suitably versatile for the weather – something to keep out the wind or rain, just in case, and something warm to wear under it or in the evenings; and also something light, for when the sun comes gloriously out from the clouds and makes you feel like a walk along the shore.